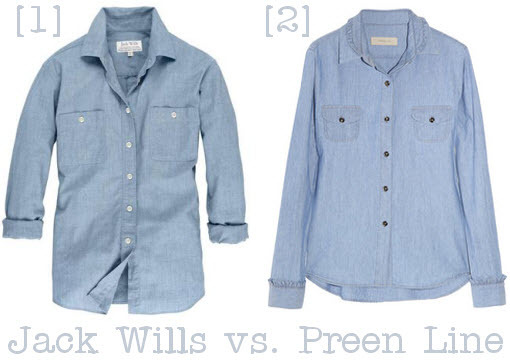 The chambray shirt – not to be confused with its more sturdy cousin, the denim shirt – is definitely having its moment. The beauty of this versatile garment is that it looks equally good dressed down with shorts or leggings, or dressed up with skinnies and a vivid statement necklace. There are plenty of chambrays currently in the shops, however the lower-priced Jacks Wills and more expensive Preen Line versions stood out the most to me. Tell me, dear readers, are you on board with this trend? Would definitely go for the jack Wills! !